THE WHAT: At its best, a music video can be one of an artist’s most uniquely powerful storytelling vehicles that can translate a thought, a concept, or a moment into an affecting visual capture that aspires to do more than entertain: it strives to genuinely to make us feel, make us experience…something. Apparently Wisconsin native and singer/songwriter Patrick Martin got that memo. 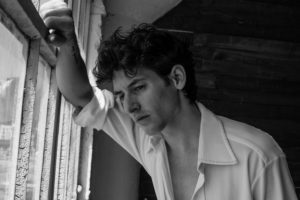 “Cinema Love” is Martin’s first video for his first single and – as far as firsts go – he’s off to a rather heady and impressive start. The song, itself, is an ode to love, but that’s only half the battle: the video (acting more like a musical movie including a title card) uses sound, vintage items, imagery, and the emotional scent of romance to engage the imagination. All the while, “Cinema Love” delicately hovers somewhere between sensuality and innocence in order to trigger a most primal and nostalgic response to the very idea of love – especially the kind that has been immortalized in film. Because try to name a place where love stories have ever seemed more epic and grand than on the big screen. Go ahead: we’ll wait. In the meantime, we’ll be over here watching Gone With The Wind for the 27th time. THE WHERE: You can discover more about Patrick Martin in all of the usual places like his official website, Facebook page, and at @p_martinmusic on Twitter.